Head for Capileira – one of the ‘pueblos blancos‘ of the region – and a restaurant awaits offering something more spicy than traditional Spanish food – and in a place you’d least expect. 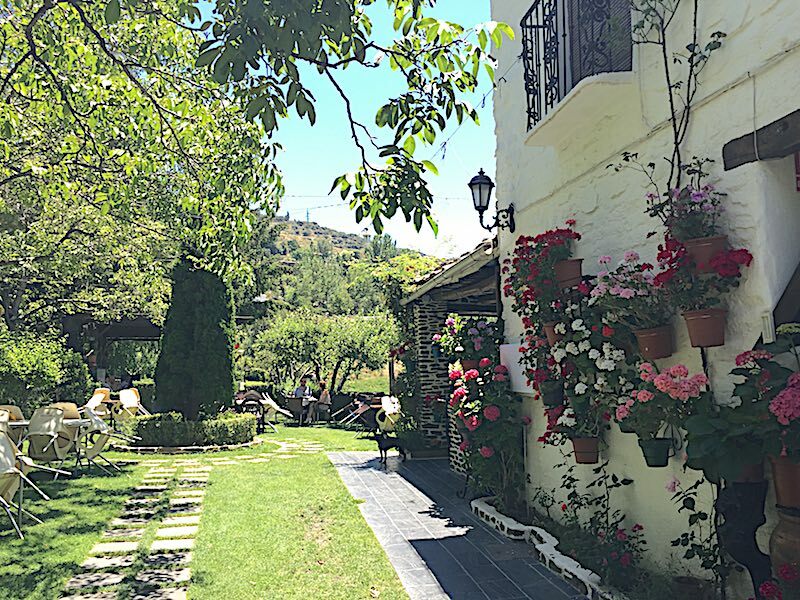 El Jardin de los Sabores (‘Garden of Flavours’) is a lovely spot with spectacular valley views. You can wile away a leisurely few hours sipping cold beer and enjoying lunch or dinner. There’s a goldfish pond, the sound of trickling water and – in August – a tree full of cherries, glistening in the sun like rubies. In the height of summer, the hazy Sierra de Lújar shimmers in the distance like a painted background in a western movie. We’ve written about curries before (see this Nerja post) and we were excited by the prospect of a different and much-loved cuisine on our doorstop. But was it worth the trek? The decently-priced menu is split between traditional Spanish food and Indian, which is what this review is about. So how to report on a place that started badly but was better the second time around: customer feedback? a change of chef? The first time we went it began with popadums and homemade dips which were delicious; then it quickly changed. We endured two poor dishes, first, chicken chilli-massala (9€) – basically a Spanish stew with a teaspoon of bland spices which was way too sweet. The chicken had no flavour and had certainly not been marinaded beforehand. The saag aloo, potato and spinach (5€), was basically patatas bravas in a gloopy, creamy sauce. We didn’t spot one fresh herb in either dish. The food also arrived suspiciously quickly. The staff, it should be said, were great – friendly and attentive. The tarka dhal (5€) was decent as was the pilau rice but our simple meal just wasn’t worth returning for. We looked at each other, sad that our dream of a good ‘local’ curry restaurant was no nearer. We returned a second time to give the place another chance; it was better but still in need of improvement. 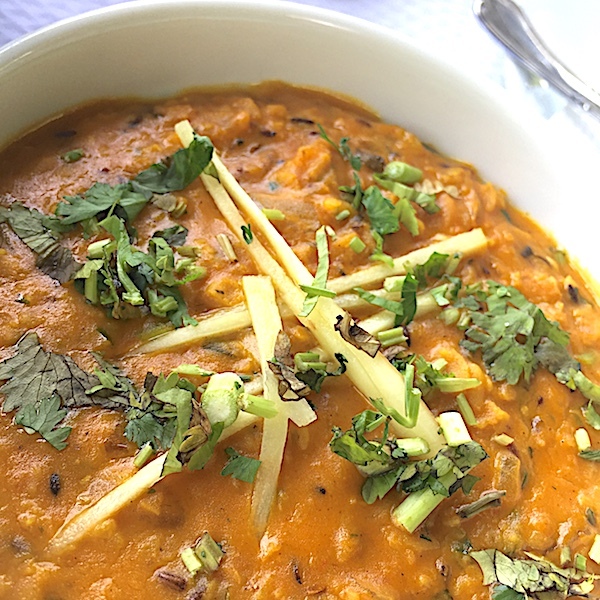 A side dish of saag was dry-cooked and very good and the tarka dhal was much better – it even had some attention to detail like a fiery burnt chilli and strands of fresh ginger. We had a vindaloo (9€) which – for the first time – actually contained whole spices like cumin seeds, but it had no fire. The meat had a hint of being in a tandoor, at least. Another blogger (who liked the place that served ‘cheddar paneer’…um) recently said that the Spanish don’t do foreign food – especially curry. Well, on our second visit a multi-generational Spanish family arrived to get stuck into the more spicy side of the menu. They seemed to really enjoy their meal and, noise-wise, it was like a public meeting on the brink of a riot. To sum up: the chef should make a proper marsala mix, giving the sauces a much-needed depth of flavour by cooking the onions, garlic, ginger and spices – the base of most curry sauces. Further advice would be to add heat/chilli where required (eg in a vindaloo), reduce the sweetness, cook food as it’s ordered (not pre-prepared), cook the tandoor meat better and use more oil/ghee. We do know our curries – we have had hundreds in our lifetime (one of us even spent a year in India). Without sounding like curry bores, it’s as if the food is cooked to suit the Spanish palate. No! cook the real thing, or not at all. There’s no doubt a small army of people in La Alpujarra are waiting for a decent curry – and who would return regularly. But El Jardin de los Sabores have to get it right. Try it yourself and let us know what you think. El Jardin de los Sabores. Camino de la Sierra, Capileira. Location of Google (opens in new window). Open every day from 11.30am to 11pm.